There has been a little discussion about scale bars recently. While most of us do not use them all of the time, they do have real value when trying to show the size of the subject in the photo. It is misleading to simply say the picture was taken at a magnification of, say, 400X, just because you have used a 40X objective and viewed with 10X eyepieces. It really does not provide the viewer with any way of determining the subject size. Suppose your microscope is set up to actually give a magnification of 400X at the film/sensor plane. Assume we photograph a round subject that is .05mm (50 micron) in diameter with two different cameras. The first camera is an "golden oldy", and uses 4x5 inch film (127mm in the wide dimension). The second camera is a new digital SLR that has a sensor 22mm wide. In both instances the image of the subject has an actual diameter of 20mm (.05mm x 400). The subject would occupy a very small part of large sheet film, but would nearly completely fill the much smaller digital sensor. So if it were said that both pictures were taken at 400X, the viewer would have the impression that the subject in the first image (upper left, the one taken on the large 4x5 inch film) is much smaller. Obviously the reason this is so misleading is that merely stating the magnification at which the picture was recorded does not take into account the degree of subsequent (additional) enlargement given to reach the viewing or "print" size. The "scale-bar" beneath the pictures removes any ambiguity. Despite the fact that the subject appears a different size in the two upper pictures, we can reference the scale bar below them and see that they are, in fact, the same size in "real" life. Determining the proper size and label dimensions for the scale bar is not difficult. I'll discuss how I have settled on doing this in a "Part II"
I'm behind you all the way about the value of scale bars in photography through the microscope. There's a good argument in favor of using them at lesser magnifications, too, and even for "familiar" subjects. See this posting for an example. That is the part I am most curious about. May I ask why multiplying the camera magnification by the enlargement magnification is that difficult to finding the total image magnification? I don't see why qualifying the format and magnification is that hard either - I agree magnification by itself is meaningless. If you are posting to the net and are unsure of display size, then making scale bars would be simple mathematics from format size or pixel pitch with the magnification at the image plane. It may be hard for people to remember what they were thinking about a full year ago, when this topic was written. However, having just finished teaching the refresher algebra class at the local university, I can assure you from personal experience that any "simple" mathematics task provides ample opportunities to get the wrong answer and never notice it. You think I'm talking about the students? Nope, me! Fortunately I crosscheck everything --- otherwise I would have handed out a final exam for which one problem said essentially "demonstrate how to numerically check this correct symbolic result"... and the result I provided to be checked was in fact wrong! That one was a simple sign error, which I caught in performing the requested check myself. The other mistake I caught was in the answer key -- I had dropped a variable in a derivation (and caught it also in a numerical crosscheck). Even so, an upper/lower case error in one formula did slip through, but in context that one didn't count because I would not have marked a student wrong for it either. MISTAKES HAPPEN --- THE IMPORTANT THING IS TO FIND AND FIX THEM BEFORE THEY CAUSE A PROBLEM. I am comfortable telling my students these things because for the last 40 years I have made quite a good living using math to develop new and useful solutions to non-trivial problems ... and still, I see mistakes being made by others and I make them myself in doing the "simplest" of calculations. The point here is that I, for one, am very supportive of any and all techniques that make life simpler and reduce the likelihood of error. Clear explanations and simple formulas are good; canned spreadsheets are better; stage micrometers and image overlays are the best that I know. Your mileage may vary; if you have better suggestions, we would love to hear about them. Rick, if canned spread sheets are sufficient, why not a spread sheet that lets you handle magnification and format? Having calibrated a number of microscope systems with a micrometer, there can be errors in that as well. (Spread sheets are also known to contain errors too.) What ever you do, you need to make sure it is done properly. I am not really convinced that magnification and format are complex. Certainly for amateurs it can be easier to calculate approximate image area from those two than using Charles' method in part II. 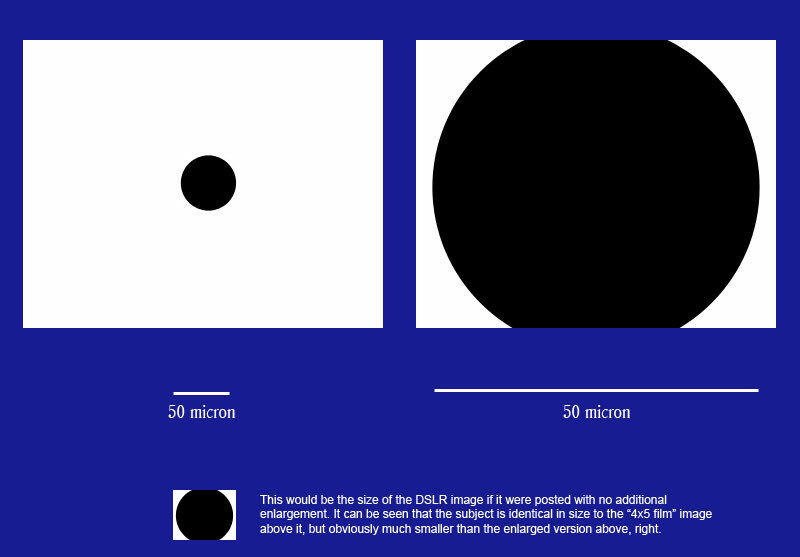 Nothing wrong with directly measuring scale on the image; it is the most accurate method and what I do at work. But even Charles does not have a micrometer, so I doubt many getting into this hobby have one either - I know Charles uses a ruler, but he is also limited to which objectives he can calibrate as well as some precision errors with such large scale lines rulers have - I also have to resort to rulers for some of our scopes and I know the problems. Using format and magnification is very straight forward, just divide format size with the optical magnification at the image plane. With two variables, there is not a great chance that a wrong operation would go unnoticed (and certainly simpler than other methods). I think Charles hit the nail on the head with his discussion of what magnification visually means for different formats. They are very clear examples. I just wish he did not approach it as some kind of Pandora's box that you want to stay clear of. And I am sorry if I am late to the party. This is why I like Christmas; even if you are a year late, you don't actually miss it. BTW, if measuring is your thing, then I would invest in Photoshop CS3 Extended Version with has some useful analysis tools for measuring image areas. CS3 also has a MatLab plugin (or Matlab has a CS3 plugin) - not used it (the plugin nor Matlab) yet, but it may offer interesting possibilities. The best method necessarily depends on the situation. Calculating from format and lens magnifications assumes that those things are known. Apparently they are, for the setups that you describe. But they are not, when for example someone points a compact camera down a scope's eyepiece and tweaks the zoom control to get good framing -- exactly the approach that a modern amateur would be likely to take. Even Charles' approach, in Part II, essentially assumes that the relay optics' magnification is not known and must be determined experimentally. After that, his method and spreadsheet does the standard calculations, which are obvious and simple -- or not -- depending on one's background and viewpoint. In re-reading this material, I don't see the "Pandora's box" approach that you mention. I suppose the writeups could be improved, but that's always easier to suggest than to actually accomplish, and I don't see offhand how to do it. It would be nice to see a small set of "best practices" writeups that describe clearly and concisely how to handle each of the most common situations. Thinking about this, I realize that the procedure I usually use is a bit different from those of both Charles and Graham. I suppose I should try writing it up and see how the explanation turns out. Rik, I am sorry, I don't understand. In Charles' example the magnification at the image plane is known. So with that and the format of the image, what is "misleading" between the 4x5 and APS-C images? Where is the ambiguity? The format dimensions become the scale bar. At 100x, my 6x6 film dimensions cover 0.56 mm x 0.56 mm as the image area is 56 mm x 56 mm. Not so hard (naturally, some folks can't tell the difference among a millimeter, parameter, and a gas meter, but I could convert to inches). I chuck on my 35mm camera and I am covering 0.24 mm x 0.36 mm. I would imagine write-ups can be improved with discussions like this one. With folks posting comments to add to the author's ideas. I think Charles showed a great example of how format affects an image. I simply don't agree that using magnification is misleading or ambiguous and scale bars are needed. You know I am not against scale bars. They look professional and really classy down there in the corner of the photograph but I have gotten the same response that Will has mentioned from people, when I show them a photograph taken through one of my scopes. I can tell them that a protist in the photograph that I have is on average 150 microns in size and I get the deer in the head light look but as Will mentioned once more, when I tell them that it is 400 times its actual size, then I get those looks of astonishment and usually a lot of questions afterwards. As I wrote, scale bars are nice and they look quite and are professional but when I look at them, could be I am just thick headed, I cannot see any relationship between them and what I am looking at. I hope we're agreed that it's all a matter of communication. But who are we communicating with, and under what circumstances? Most people have no clue what a micron is and can't do arithmetic either. Photos get resized and cropped, captions get edited, and information gets lost. If we specify only the format size and the magnification, then everything is great -- as long as the photo doesn't get cropped, and both the magnification and the format size get carried along with the photo, and we're dealing with a viewer who understands how to multiply (uh, divide, in this case), and finally that the viewer understands that the magnification refers to the original format size and not the size of the image as reproduced. Quite frankly, that all strikes me as a pretty uncommon set of circumstances. On the other hand, if we stick a scale bar in the image, then almost all of those problems disappear. More generally, the problem is that people have no direct experience with really small dimensions. Instead, we understand small dimensions in terms of magnification -- the subject is "N times smaller" than something that we do have experience with. 1. Always include a scale bar to protect against format changes and so the image can stand alone if it has to. 2. Never use microns when mm will suffice. 3. Quote magnifications for very small things, but always spell out what you mean. What you see here is roughly what you'd see through a 100X microscope. On a typical monitor, the image is actually reproduced at about 250X. Will, that image was made by an amateur using a compact camera on zoom pointing down an eyepiece. But I agree completely that nobody using a compact camera will try to figure out magnification at the sensor. That doesn't bother me at all, because (in my view) magnification at the sensor is quite irrelevant for most purposes. What matters is how big the subject is, referenced against something that the viewer understands. I think it's great to say that your photo on the wall is 5000x life size -- because the viewer can see directly how big the photo is, and you're pointing at the photo while you say the words. But I am a lot less happy when I go to the Nikon Small World gallery of winners for 2005 and see that 1st place is the head of a housefly at "6.25x" while 15th place is almost an entire geranium flower at "20x". Clearly these numbers are not comparable to each other, but there's no way to know that except by already knowing the subject matter. One or both of those numbers is misleading, and I believe that's exactly the situation that Charles is talking about when he uses that term. But I am a lot less happy when I go to the Nikon Small World gallery of winners for 2005 and see that 1st place is the head of a housefly at "6.25x" while 15th place is almost an entire geranium flower at "20x". Funny you mentioned that particular example because that was sort of the "final straw"' that put me on this "scale bar" kick. It is so obvious that even some people who really should understand magnification concepts don't ... and so often all you ever get for magnification in photomicrography is the product of the objectives and eyepieces, which is terribly misleading. May I ask why multiplying the camera magnification by the enlargement magnification is that difficult to finding the total image magnification? It's not difficult at all, very simple really. But they made a 40 inch high print for the Small World reception. At that size the fly is 305X life-size (easy to calculate from the info I provided). That would have made a proper and helpful caption for the print, but unfortunately it still gets labeled as 6.5X! I'm convinced that the vast majority of people just don't think in format size anymore. Beside you Will, I'm not aware of a single person participating in the microscope section of this group who shoots a "standard" film format. And while they could tell you what brand of digital camera they use, I would be extremely surprised if they could tell you the sensor size (1/1.7", 1/2.5", 1/3" ...etc) and even more surprised if they had any idea of the actual sensor physical dimensions. So while I often provide the magnification-on-sensor, along with the sensor size, I do think that a scale bar is generally far more useful. It makes no difference if the picture gets cropped, printed 2 inches tall, or 20 feet tall ... there is always an accurate size reference. And if it seems your audience will have no real concept of "microns" than label it in "mm" or "inches" (even looks more impressive that way). In print situations where scale bars are not appropriate and you know the print size and have control of caption information then it's certainly great to give the overall magnification. I guess I feel that the implication that format and magnification are complex and difficult to deal with strange. Huh? Sorry Will, just don't see it. Can you tell me where I have implied this is complex and difficult, or that it is a Pandora's box to be avoided? Really... if this is so I would like to change the language used because I certainly don't see it that way, and certainly did not intend to make it sound as if it were. The methodology in part two is really simple. You can be extremely precise... with careful "on sensor" magnification calibration with a stage micrometer... or, if your work does not need that degree of precision, more casual with a finely scribed metric ruler. (I made it abundantly clear that a stage micrometer is the best way). There are many people who will never see the need to pay what a good stage micrometer costs. But they should not be discouraged from providing reasonably accurate scale information. But if the amateur is randomly snapping away with his zoom down the eyepiece, then this discussion is rather academic as the magnification at the image plane will be unknown as it will vary from shot to shot. And can't even imagine someone using a compact camera that way trying to figure out magnification at the sensor. If the photographer is that casual about it then he's probably not going to be reading this anyway. I've conversed with many "amateurs" using point-and-shoots through eyepieces. Usually the cameras are held in place by a rigid adapter. A zoom setting is determined (if needed) that will eliminate vignetting, the camera focus is locked at "infinity" and they always use the same eyepiece. They keep these parameters the same whenever they take photomicrographs and so there is no reason they cannot arrive at a reasonably accurate value for the magnification of their relay optics (eyepiece, camera lens at infinity at a consistent zoom setting). BTW... the spreadsheet referenced in Part II was also intended to help out those using Helicon Focus. In the Helicon Focus "scale bar function" they want the user to provide either the "Number of pixels" or "Percentage of Width" to draw the proper length for the scale bars the program produces. That's the reason for a % value included on the sheet. Normally a % value would be of limited use. Charles, maybe I am reading more into your comments than are there. You were using "misleading" in terms of magnification when two images are shot on two different formats. You also are saying there is ambiguity in these cases. This is were I get the impression you believe the concept of magnification is complex. I don't find "100x on 4x5 sheet film" or "50x on an APS-C size sensor" misleading or ambiguous. I think you have said something very important. There are folks who don't understand magnification - linear or angular. They will look through a scope working visually at 100x and say the camera is also at 100x even though the magnification at the image plane is maybe only 10x. There is a big disconnect when it comes to what people see and the simple concept of linear magnification. (Then you get the binocular and telescope crowd can't make the jump from angular to linear magnification and get all befuddled.) I find this strange because linear magnification is not difficult, (but it appears the folks who run the Small World competition don't understand it). Now it seem the problem is not magnification, but people not using it correctly. That is annoying. Unfortunately, I think that misunderstanding comes early for most folks. It seems they think magnification describes what something looks like rather than a ratio between object and image size. I guess when you take something at 5x, it is always 5x - well, the picture looks the same no matter how big it is (angular magnification confusion). And if another camera takes a picture that looks the same, it must also be 5x. The confusion is not difficult to understand as I think most photographers are visual folks and comparisons are likewise visual. I work at an institute of hire education. I train a lot of science faculty and students on our scopes. I have found since our cameras and camera drivers do scale bars automatically (after I calibrate them using a micrometer), that very few of these people understand how to create their own scale bars or even how they are created. I have done the linear magnification/sensor size/pixel pitch lecture, but the best I get is glazed eyes. It seem that since the technology does the work automatically, there is no incentive to find out more. This is not a good sign as if they don't have the technology, how are they going to solve the problem of scale? I don't blame them as all they need is information, but I do find it discouraging. BTW, I am not arguing against scale bars. Perhaps I am arguing for better linear magnification education. It is misleading to simply say the picture was taken at a magnification of, say, 400X, just because you have used a 40X objective and viewed with 10X eyepieces. It definitely is misleading and ambiguous unless a format size is given, and it is clear that the magnification provided is that which is recorded, not viewed. You are working in a much more "advanced" environment in regards to this area than most of us. At least in my experience it has been extremely rare to find images that do not include scale bars but are captioned with recorded magnification and sensor size, or with some other information that is essential for determining subject size. Unfortunately this is rare. Far more common is the captioning given above the photomicrographs found on this "scholarly" page. It clearly illustrates my initial point restated above. If I had no concept of what the subjects were, I could really form no valid sense of their size, even though the images are clearly labeled with the "magnification". I've got 5 grown kids. A "nano" to them is a type of iPod. When I talk about loading sheet film holders I get the impression they think I may have been an assistant to Matthew Brady (won't even talk about coating glass plates!). Even the ones that enjoy taking pictures would not have a clue if I mentioned "APS-C size". "6x6", "6x12", "4x5" have meanings and sizes that are etched in our brains, but if you're talking to people under 25 most would be headed for the computer and Google. So I think it is better to work with "numbers" rather than mention formats that fewer and fewer people are familiar with. I think we're really on the same page here, just looking at the same thing from slightly different points of view. I was thinking about editing my initial posts, but I suppose the needed points have been made in these recent discussions. Charlie, the great thing about the internet is it gives more opportunity to be misunderstood. I think we are on the same (web)page.